A 22ft high Damien Hirst statue is to be displayed on the top of the Royal West of England Academy in Bristol. The statue, called Charity, is of a collection box of a girl with teddy bear and her leg in callipers. The RWA said Bristol-born Hirst has "scuffed her appearance and burgled her charity box to highlight the erosion of society's values". 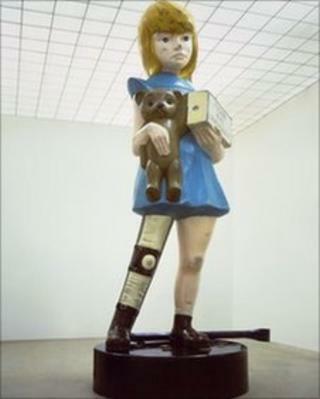 The Charity statue was originally installed outside London's White Cube gallery in a 2003 exhibition by Hirst. The RWA said it was "thrilled to host this landmark" which will remain on the building at the bottom of Whiteladies Road for a year. Hirst is well known for his headline-grabbing conceptual artworks, which include sharks suspended in formaldehyde and a skull encrusted in diamonds. He recently announced he had stopped making installations in favour of traditional paintings by hand. The statue is being installed at the start of June a short distance from the Bristol Museum which hosted a Banksy exhibition in 2009.